Dear Doctor | Nashville Dental Inc. Videos are great attention grabbers and dental videos help patients and families visualize, understand, and retain the information they need to be active participants in their oral health care. Dear Doctor’s Patient Education Videos are beautifully presented, accurate, and above all, entertaining. Easy to add to any website: Just put us in touch with your website person and we’ll handle the implementation. Click here for pricing and to sign up! 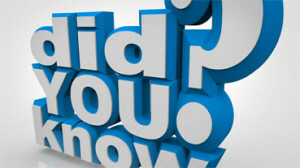 On average, patients spend more than 15 minutes in your reception area during each visit. 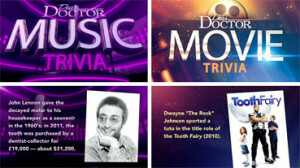 Put that time to good use with Dear Doctor TV! 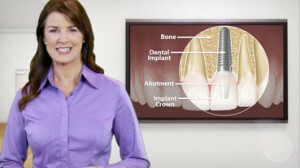 With our educational, entertaining and consumer-friendly content, your patients will learn more about dentistry as you build your brand in a fun and relaxing way. 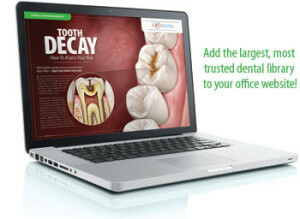 With Dear Doctor’s intelligent delivery system, your screens will only display content that best suits your practice. 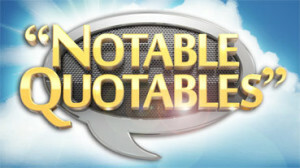 We are constantly creating new segments that are delivered to your TV instantly… and automatically. We monitor your entire system to ensure a seamless broadcast. Your staff will have no day-to-day responsibilities. In addition to your waiting room, we can broadcast to any TV screen in your office. Additional hardware may be required. Broadcast can be provided with or without sound to suit your office environment. We work hard to earn your business each and every month with quality you can count on. 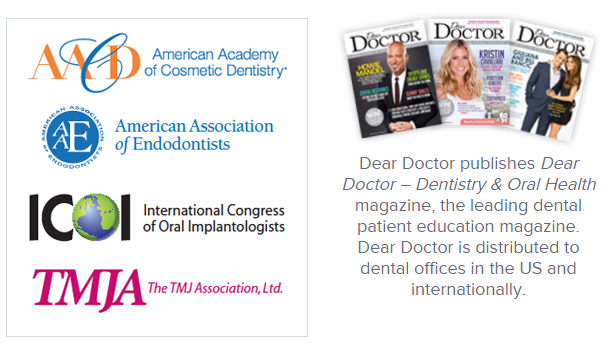 Dear Doctor partners with some of the nation’s most respected professional dental organizations to produce a wealth of dentistry-related video content that is lively, informative, and trustworthy. Segments take a variety of forms, from speedy “fun facts” and “trivia” to lengthier celebrity interviews and treatment overviews. Best of all, the broadcast to your office is customized to stimulate patient interest in the services you provide. Frequent updates occur automatically via your wireless internet connection so that your patients always have something new to watch — in the reception area, the operatory, or anywhere else you see fit. 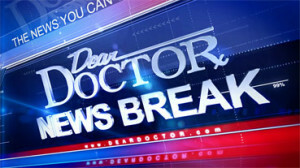 Dear Doctor is constantly creating new programming to educate and entertain your patients. Below are some of the many segments they’ll see on DDTV! 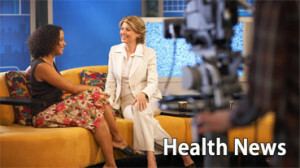 Featured segments that explain specific treatments and procedures; only services offered at your practice will be broadcast. Stars share stories about their own oral health and experiences in the dental chair — often for the first time! 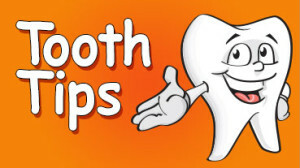 Easy-to-follow instructions and demonstrations on important oral hygiene procedures. Provocative short segments that offer new ways of looking at dentistry and oral health. 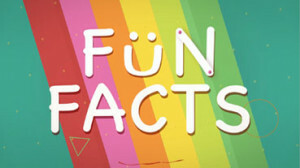 Information-filled segments organized into engaging top-five lists of tips and facts. 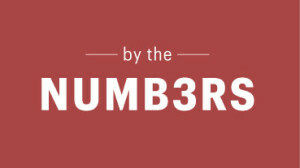 Some dental topics are best told by the numbers — with stats and figures that are sure to provoke thought as well as conversation. 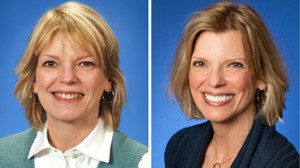 Heartwarming stories of everyday people whose lives were changed by dental makeovers. Quick hits on dentistry that are as visually engaging as they are amusing. Brain-teasers about movies, television, sports and other subjects — all with a dental focus. 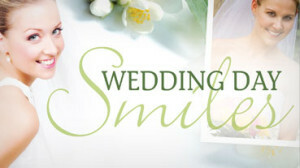 Getting your smile ready for the big day: What are the options? Advice on oral health and hygiene geared to younger patients and their parents. 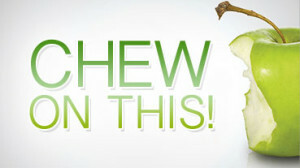 If it has to do with dentistry, we’ll run it down! Keep up with world news and the latest events. Find out what actors, musicians, sports heroes and other notables have to say about all things dental.